A simple, fast, and sensitive method for determination of 17 β-estradiol (E2) in goat milk samples has been developed by combining selective molecularly imprinted matrix solid-phase dispersion (MIP–MSPD) and liquid chromatography with diode-array detection (DAD). The molecularly imprinted polymer was synthesized by use of 17β-estradiol as template molecule, methacrylic acid as functional monomer, ethylene glycol dimethacrylate as crosslinker monomer, azobisisobutyronitrile as initiator, and acetonitrile as porogen, and was used as selective solid support for matrix solid-phase dispersion. The selected dispersant had high affinity for E2 in the goat milk matrix and the extract obtained was sufficiently clean for direct injection for HPLC analysis without any interferences from the matrix. The proposed MIP–MSPD method was validated for linearity, precision, accuracy, decision limit (CCα) and detection capability (CCβ), in accordance with European Commission Decision 2002/657/EC criteria. Linearity ranged from 0.3–10 μg g−1 (correlation coefficient r 2 > 0.999). Mean recovery of E2 from goat milk samples at different spiked levels was between 89.5 and 92.2%, with RSD values within 1.3–2%. CCα and CCβ values were 0.36 and 0.39 μg g−1, respectively. The developed MIP–MSPD method was successfully applied to direct determination of E2 in goat milk samples. 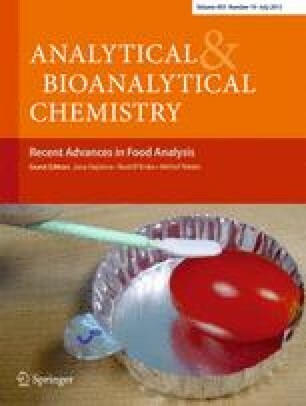 Published in the special paper collection Recent Advances in Food Analysis with guest editors J. Hajslova, R. Krska, M. Nielen. The authors thank the Comunidad Autónoma de Madrid (Spain) and European funding from the FEDER Programme (project S2009/AGR-1464, ANALISYC-II) for financial support.